Today I mounted up my brand new King Cage Manything Cages with SKS Adaptors onto my front forks for their first test ride. I was using them on my Specialized Crux cyclocross bike, which has carbon forks with no lugs for cages on the forks. I have heard of people using the SKS adaptors on carbon forks so I thought it was worth a try. Plus with my short legs I’m limited in places where I can fit gear for bike packing – I have a very small rear seat bag and limited frame space. So the idea is to use these cages on my forks to hold dry bags. Aside from the possibility of damaging my carbon forks, my main concerns were the impact on steering and bike handling, plus the possibility that the adaptors wouldn’t hold and would slip. First up: the SKS adaptors. These come in a pack of two, but they are individual adaptors for each lug. So I ordered three packs to get three sets of adaptors for the two cages. The adaptors are basically a plastic triangle mount with a softer plastic backing and a Velcro strap with a non slip plastic strip on the back. 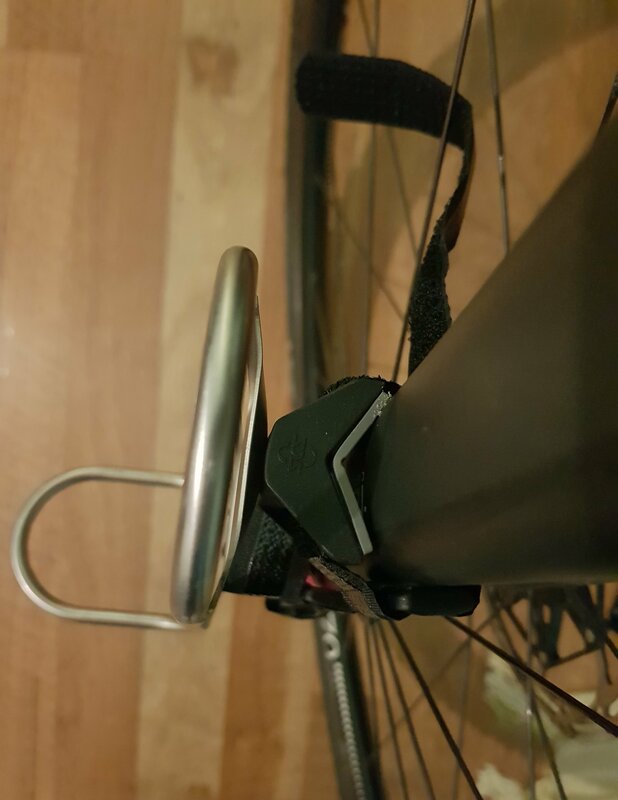 They also come with screws so you just screw the cage into the hole in the front of the adaptor, then use the Velcro strap to attach the adaptor (with cage) to the bike. Very easy. SKS adaptor on the bike. Note the triangle shaped mount and the excess Velcro strap. The mounting straps are really long. Like about twice as long as I needed for my forks. But I was reluctant to cut them off, so I bought some stick-on Velcro dots, stuck one to each strap, wrapped the strap around the adaptor, and stuck the end of the strap to the dot. These are still holding so far but I reckon I’ll need a sturdier option for a multi day off road trip. The Manything cages are made of titanium and are super light. Something like 37g. They come with two orange Voile straps, which again were much longer than I needed. I figure this means I can mount much wider loads! A note on placement of the cages. Because I’ve got disc brakes, on the left side fork I couldn’t mount the cage right at the bottom of the fork because it was just too close to the disc brake to fit the adaptor strap plus then tie the Voile strap around. So I put the cage higher on the left side, but the right side cage is at the bottom of the fork. This was a test because I may need the extra length for carrying some things. Two manything cages mounted on the front forks. Note the height difference. 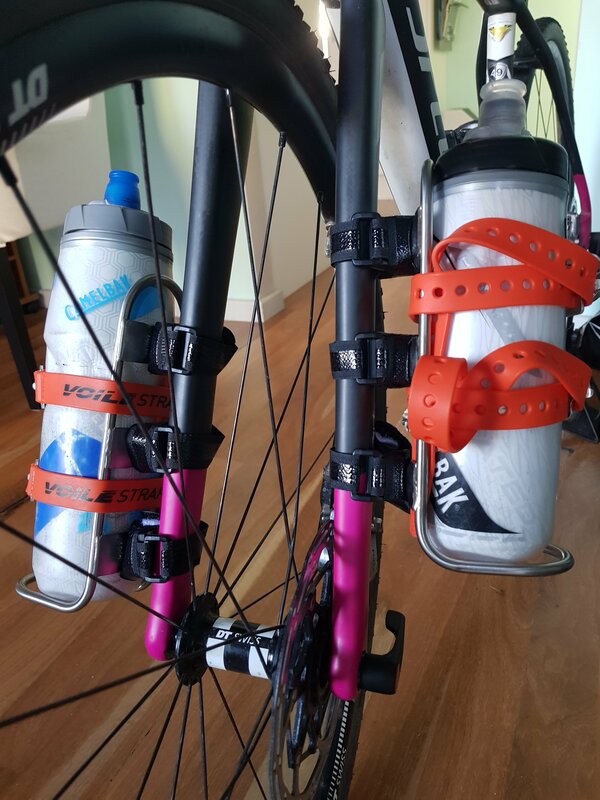 For my test ride, I mounted a full water bottle to each side. One side was a 600mL bidon and the other was 750mL. The 750mL full bidon weighed 815g, plus the two straps it was 870g. Bottles secured, I headed off for my test ride. Bidons mounted, 700-900g each side. Note the excessively long Voile straps. The test was an outstanding success! I couldn’t even tell I had extra weight on the bike, let alone any difference in handling. And the loads and cages didn’t move at all. I could even still lift the front wheel to get up a curb, and that is not my strongest skill at the best of times. If I was really trying, I could notice a slight difference in cornering one direction versus the other direction for tight corners, which I think may be due to the weight difference. But it was a fractional difference. I think the loads had minimal impact on handling because they were attached close to the pivot point for cornering i.e. the centerline of the handlebars. I also think having the weight lower helps with lowering the centre of gravity and therefore should improve handling. The next test is to see what impact a wider load has. Plus a test ride on gravelly hills might be a good idea. Tagged adventure tips, bike camping, bike holiday, micro-adventure. Great idea thanks for sharing! I’d been very interested to see how much weight or can carry, any thoughts on this? I’m now thinking of doing this too for up to about 3kg per cage so I contacted SKS to ask about maximum wright carrying capacity and they just got back to me saying “We tested the ANYWHERE for the general using: bottle cage with bottle. So, the general carrying capacity is up to 1 Kg.” They went on to say it could vary with conditions such as diameter, mounting angle and surface. I’d love to hear about any experiments you do like this though! Hi Brendhan – the latest update in my testing is that I tried it on the weekend on a cruisey bike paths ride with a 1.5kg thermos and it was fine, still no movement. Of course it isn’t the same as off-road riding – yet to be tested! On the other side I tried to tie a bag with my cooking pot and gas canister. I’ve learnt that you really need a solid/ sturdy bag to pack loose stuff in otherwise it is impossible to keep it together and tie it on. Hi. I just searching for something like this. I Want to mount two Blackburn Outpost cages on my Rock Shox fork (MTB bike) and I wonder if this cage with load about 2-3 kg will be able to stay in place fixed with three SKS straps. 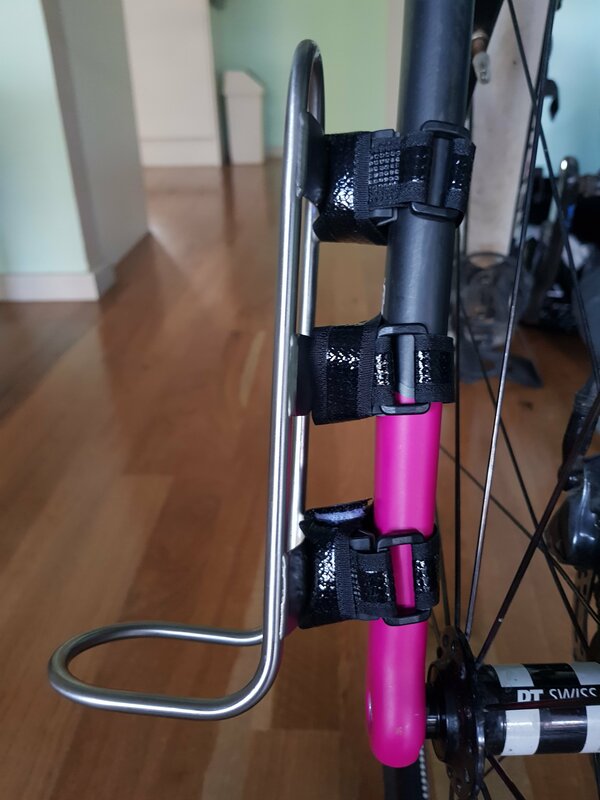 Hi Marcin, I did a ride on the weekend with my manything cages attached to my mountain bike forks with 3 x SKS adaptors each. I also put non-slip matting around the forks under the adaptors, which helped keep them in place while under load. 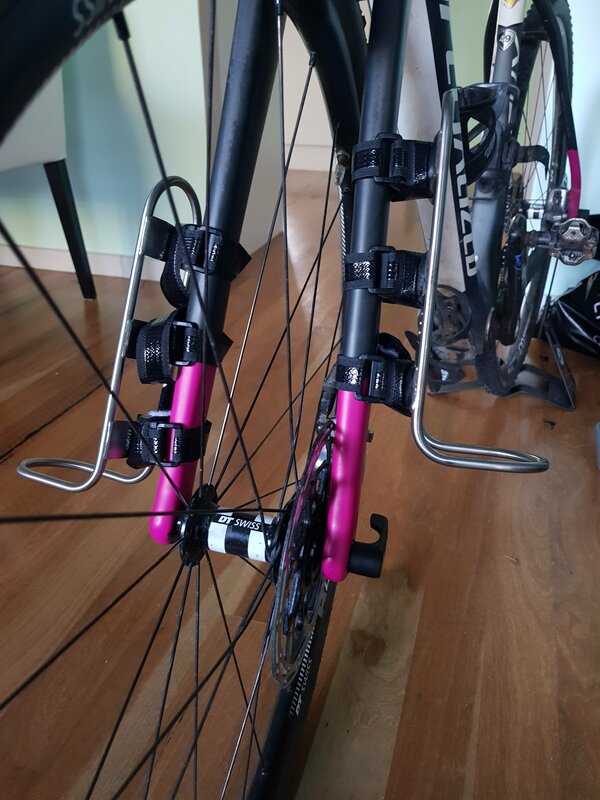 I had about 2kg on each side and they were fine – I tightened the adaptors in the morning before re mounting the bags but they seemed very stable while riding.